Over 50 actual field-tested heat exchangers are brought right to the class room for your personal inspection. See the stress points, fracture zones, and design considerations which you MUST know in order to properly inspect a furnace. The heat exchangers reviews come from actual inspections, just like the ones you perform as part of your daily routine. You will learn how to identify wear-patterns of various exchanger designs. By attending our heat exchanger training, you will be able to quickly see repeating trouble spots of various furnaces which can greatly decrease inspection time. Every furnace installer and inspector can benefit from this seminar. The information presented represents over 50 years of combined expertise in the heating industry. Learn the secrets of the trade now so you can apply them throughout your career. Russell Prach, son of Ellis, has grown up in this industry. Shadowing his father, Russell has acquired Ellis’ expertise on heat exchanger services, and is eager to pass it along. 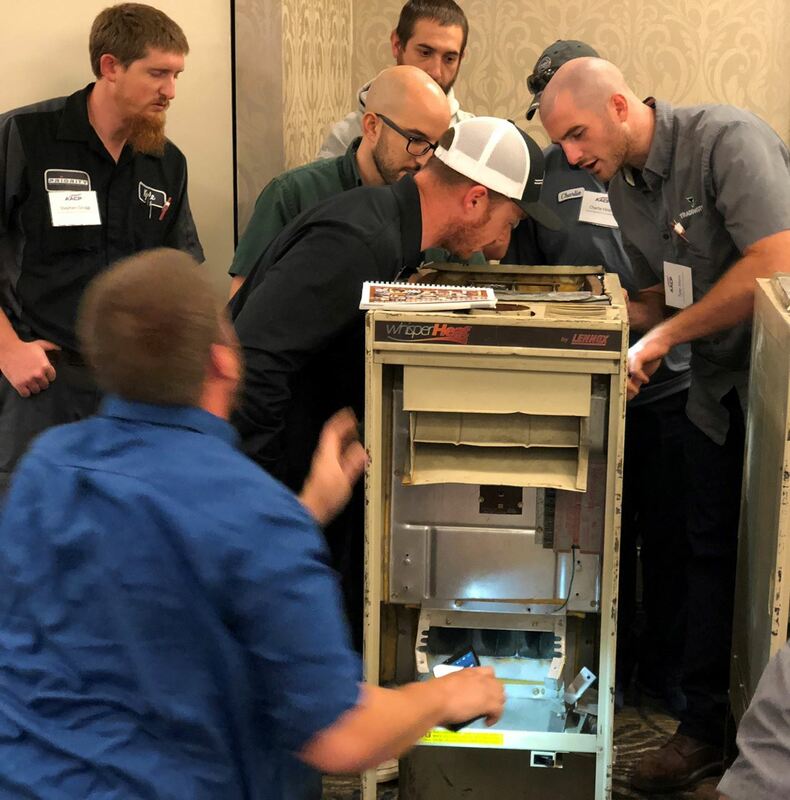 Russell’s passion and enthusiasm for this trade is contagious; you will see his enthusiasm transpire in his teaching methods as he captures the attention of each and every student or attendee. Thanks to Russell's passion, both contractors, and home inspectors alike, leave the class inspired and excited to use their newfound knowledge in the field. Meet the youngest instructor on our team, Christopher Prach. Although new to the training, Christopher grew up in this industry under Ellis, so heat exchanger training and servicing are both very familiar to him. The knowledge he brings from his extensive field experience, accompanied by the expertise passed down from his father, Christopher makes a great addition to the instructing team. When Christopher is not on tour, aside from being a father, he oversees the field operations in our service company. Registration is limited to 35 attendees. Reserve your spot today! This class will start promptly at 8:00 am. Attendees must arrive by 7:30 a.m. to check-in. Must bring their NATE certification card to class (or know your number) to be credited the hours. Attendees will sign a NATE continuing education form during class. We cannot waste valuable time. If a student is rude, a distraction, or falls asleep during class, they will immediately be dismissed and no refund will be given for that student.